Wholesale Domestic Bathrooms supports STV Children's Appeal. In 2018 Wholesale Domestic Bathrooms are the official sponsor of the Big Scottish Breakfast, an annual STV Children's Appeal fundraising event supporting children and young people affected by poverty in Scotland. The Big Scottish Breakfast held on Friday 5th October, with schools, businesses and sports teams across the country getting together for fun breakfast events to raised money for Scotland’s children. 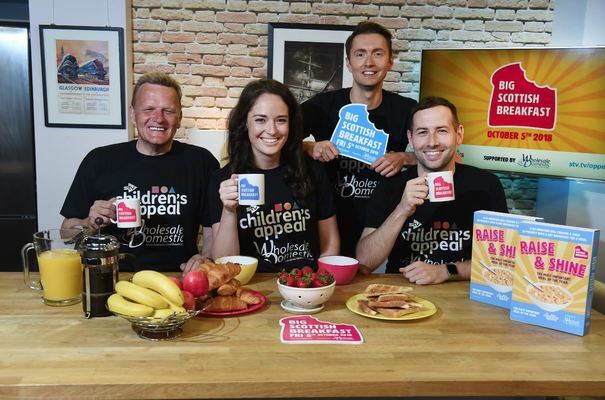 Sean Batty said: “The Big Scottish Breakfast got off to a great start last year with breakfast events across the country raising money for Scotland's children. I had lots of fun getting involved and it wasn't just a case of eating croissants and toast - most fundraisers had me doing spin classes, zumba or dancing to weather themed songs! “This year we're determined to go even bigger and better, and I’d love to see schools, businesses and groups right across the country join in with their own Big Scottish Breakfast event. STV Children’s Appeal is part of STV Appeal, SCIO SC042429.